A 57 point jump in the ASX 200 index on the first day of trading for the New Year! A wonderful start of the year bonus for investors around the globe; per courtesy of the US politicians, who appeared to have agreed at the last moment on how to manage the $16.2 trillion of US debt. Although in reality little may have changed yet for the global economy, suddenly the financial world was smiling again. Frowns had not returned by the end of the week, when the XJO was still 52.5 points higher from the closing price for 2012. 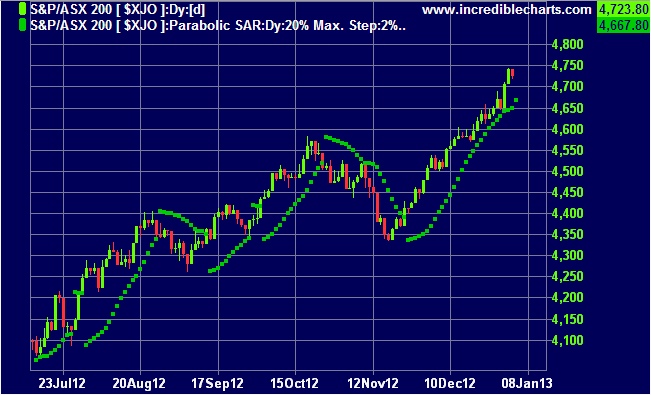 The chart above features the parabolic indicator. It is simple, but brilliant in concept, and one of a trio of innovative techniques introduced J Welles Wilder. The dots represent a series of stop/loss positions calculated daily from the previous day’s high/low price using an acceleration factor to augment the stop movement with time. The resulting curve provides a graphic representation of the speed (or momentum) of price movement. It demonstrates how price movements alternate in direction. A step higher followed by a step lower; an impulsive change followed by a corrective adjustment. There is nothing comparable to the advance and decline of the market in the natural world. More than anything else it resembles a game of snakes and ladders, except for not being pre-determined, but apparently random. The value of the indicator is greatest in trending markets, with significant volatility. It alerts to impending price reversal, likely to erode the gains of profitable positions. The present impulsive move on the daily XJO in place since the 19th November 2012 was losing momentum at the year-end, and looked about to give a stop and reversal signal for exit. However a new high just short of 4750 has carried the price action safely above the stop at 4670 for the present. With economic sentiment tending to be cautiously optimistic, and cash returns so low, the expectation is for further steady gains. Tags: ASX 200 charts, J. Welles Wilder Jr.